Coffee beans themselves are high in antioxidants and have enough caffeine to provide that "java jolt" you're craving bright and early in the day — so, no judgement here if your a.m. coffee of choice is the simple, black kind. However, there's never been a better time to want more from your cup of java. It's becoming quite the trend to add buzzed-about ingredients, such as collagen powder or MCT oil, to perk up your drink with additional health benefits. Don't know where to start? You can go all out, experimenting with mushroom coffee or a Bulletproof recipe, or ease into it with a sprinkle or two of cinnamon or cacao powder. These tweaks might help you discover your new favorite (extra healthy) coffee drink. It sure beats ordering a sugar-laden Frappuccino... and you can only have so many pumpkin spice lattes, right? Collagen powder is a protein-packed, tasteless additive that will make you feel full when added to coffee. "Collagen would be a welcome fixture in morning coffee. It's pure protein; no sugar; very little carbohydrate; and it's essentially what bone/tissue/hair/skin/nail/joints are made of (it's a protein)," says Monica Auslander Moreno, MS, RD, LD/N and nutrition consultant for RSP Nutrition. What's more, according to a study in Nutrients, there's some evidence that using collagen powder (in this particular study, from bovine bone) may help improve the integrity and elasticity of skin tissues and act as an anti-aging agent. To reap the benefits, add a scoop of collagen powder in your coffee and stir to dissolve. Not only does cinnamon add a tasty, spicy kick, but it's loaded with heart-healthy benefits. "Cinnamon lends sweetness without sugar and fights inflammation, and most notably, it may even be able to lower blood sugar," Moreno says. Studies back this up, claiming that cinnamon consumption will lower fasting blood glucose levels, which is great news for those with heart or blood sugar conditions. Blood glucose levels indicate the amount of glucose in your blood, and it's important to keep in it in the normal range of 100 mg/dL. Since cinnamon reduces the amount, it improves management for those with diabetic conditions. "Research finds cinnamon can help with blood sugar control for people with type 2 diabetes. For everyone else, it's a tasty way to add antioxidant polyphenols that may have some anti-inflammatory effects, too," explains Maggie Moon, MS, RD. Lastly, cinnamon can help suppress your appetite — so your cuppa can hold down the fort until your next meal. How much should you stir in? A dash is more than enough, Moon says. If you like your healthy coffee nice and creamy, high-fat milk is the way to go. The extra fat content promotes satiety, leading to less mindless munchies and cravings ready in the day, explains Moreno. "A splash of grass-fed milk, cream, or an unsweetened nut milk would be a nice addition," she says. These types of milk have good fats, like unsaturated and omega-3 fatty acids, to protect the heart and make each sip that much more satisfying. Stirring 1 to 2 tablespoons of pure cacao powder into your morning java could be responsible for a major antioxidant boost in your coffee cup. "100 percent cacao powder can help lower blood pressure, improve insulin sensitivity, and boost mood and blood flow to the brain — all without added sugar or fat," says Moon. According to nutrition consultant Moreno, cacao also has iron and magnesium, which is great for muscle repair and healthy blood cells. But beware: cacao powder has a nice amount of caffeine on its own, so if you are already sensitive to caffeine, it's best to avoid this additive. Waking up to a healthy coffee can immediately jump-start your day, especially if you're getting in a morning workout. "A lot of people use coffee as their pre-workout fuel [or] some folks are practicing intermittent fasting, or don't feel well enough in the morning to eat a proper breakfast," says Moreno. "While caffeine will provide some energy, fuel from nutrients would be ideal before a morning of work, or working out," she explains. Add a scoop of your favorite protein powder, whether it's flavored or not, to your coffee for some long-lasting energy. Wait, coffee what?! Coffee fruit, or the pulp that holds the coffee bean as its center, can be used to further increase your the health benefits of your cup. "Coffee fruit is the fleshy portion that surrounds the coffee bean, typically discarded at harvest. Coffee fruit comes in a dried powder that you can add to your coffee," explains Dr. Mike Roussell, PhD, co-founder of Neuro Coffee. And coffee fruit powder is a powerful antioxidant that fights oxidative stress and offers brain benefits, such as increasing BDNF, a neuro-super protein responsible for growth of new neurons and the repair of broken ones, Roussell says. To reap the benefits, just mix in some dried coffee fruit powder. 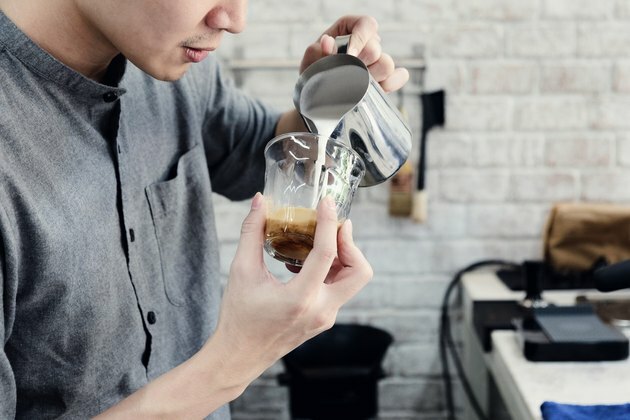 "The most straightforward benefit of adding fat in the form of MCT oil or coconut oil to coffee, a la Bulletproof coffee, is adding calories for satiety," says Moon. However, most people don't need these extra calories in their day, but if [they] like the taste, [they should] enjoy it — just balance it out with the rest of the day's food choices," she says. If you're looking to experiment with oils, though, you can also try olive oil, says Moon. "You would get the benefit of some polyphenols and cholesterol-lowering unsaturated fats," in a 1-tablespoon serving, she says. 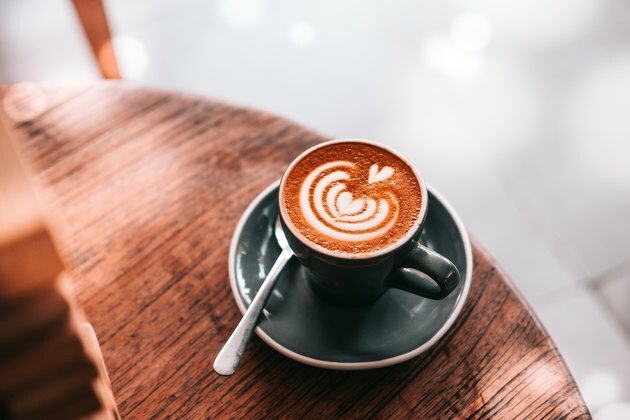 "Coffee contains some potassium, but adding coconut water really boosts the potassium levels, which is important for lowering blood pressure and keeping muscles healthy," explains Moon. It can also help reduced leg cramps, quench thirst, and provide essential nutrients, minerals, and antioxidants that taste delicious and keep the body hydrated, explains Dr. M Daniela Torchia, RD, PhD. Opt for an unsweetened coconut water to keep sugar and carbohydrates low. There are more ways to use mushrooms in the kitchen, but mushroom coffee, which consists of mixing mushroom powder into coffee, might just be your magical elixir for fighting that nasty common cold. "Very early research suggests mushrooms work through the gut microbiota to boost immunity and inflammatory responses," says Moon. Those effects can leave you with fewer sick days and better digestion, which will keep the body strong and well. And these mushrooms may even lower risk of cancer, adds Torchia. Studies show that "white button mushroom (WBM) powder for example has been shown to have health benefits, including reducing PSA (prostate stimulating androgen) in cancer patients," she explains. 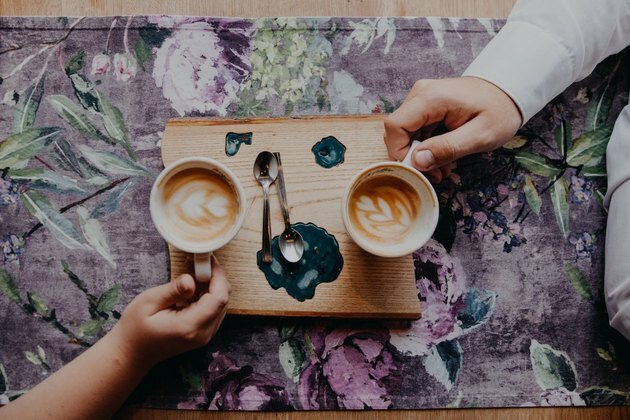 Even though a straight cup of java will give you caffeine and energy, switching things up with offerings from collagen powder to mushroom coffee and experimenting with different flavors is worth it. These subtle tweaks may improve nutritional value and satiety levels and you can feel more satisfied with each sip. Give them a try!